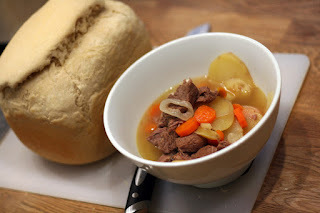 OK so with Saint Patrick's day 2012 say just a few days away I thought I would post up this quite simple recipe for Irish Stew that takes advantage of using up that unwanted whisky you have on the shelf. Yet again for those non-cooks in the club this one will enhance your culinary skills and help impress the ladies. 1. Cut meat into joints (keep on bone where possible), then place in bag with flour and coat the meat by shaking it all around. If no bag simply flour meat as best as you can. Keep the bone as you need this in the stew. 2. Lightly brown meat to seal in the juices then reserve on plate (use pot you will be baking in if you are not using a slow cooker to assist gravy base). If you have a pressure cooker place the meat into pressure cooker for 15min to give extra tenderness after browning. 3. Brown potatoes with a little olive oil. You will have to do this in stages as you do not want to break up the potatoes. Browning the potatoes helps to bring out the starches which help thicken the stew. I leave the skin on the potatoes as it helps to keep the potato from falling apart in the stew. 4. 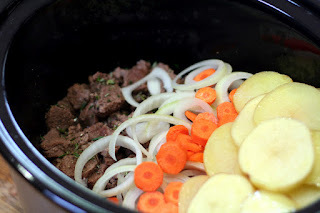 Layer ingredients in pot starting with lamb, onions, carrots, some parsley, then potatoes. Season meat with salt and pepper when added. Find a spot in the middle to add the bay leaf and bone as you layer. 5. Blend your remaining flour extracted form the bag in a cup with a small amount of stock or water and whisky until it is a paste. Keep adding stock or water and whisky until it is fully blended. NO LUMPS! (don't be lazy this is important). 6. Pour all your flour/stock/whisky mixture gently over the layered ingredients and place in oven, on stove top or slow cooker and cook for 4 hours (average) on low to medium heat until tender. DO not let the ingredient boil or dry out. See Cooking instructions below. 7. Serve it up in a nice big bowl with a healthy wedge of fresh crusty bread. Slow Cooker: Set slow cooker to high for 4hrs or 7hrs on low and stew will come out perfect. Do not stir EVER and turn down to low if necessary so it does not dry out. Oven: Preheat over to 150º C. Cook for 4hrs with lid on. No need to stir EVER and top up with a small amount of hot water if looking too dry. Stove Top: Place pot on stove with lid. Set heat to high and leave on high until liquid begins to bubble and then turn down low. Cook for 3 to 4hrs. If you have a food thermometer try to not allow the core to get over 150ºC. You may need to dig down with spoon to check things are not burring or catching on the bottom. If they are try to make a well and add some water to the base. ONLY STIR if starting to stick and even then so gently you are just lifting off the base to get the moister back down there. Irish stew is meant to be a fluid stew. It is not supposed to be a soup and or a thick sticky stew so top up with a little hot water during cooking if needed. Any whisky can be used and in fact does not have to be used at all. I only use the dodgy whiskies I will not drink such as Johnny Walker Double Black. 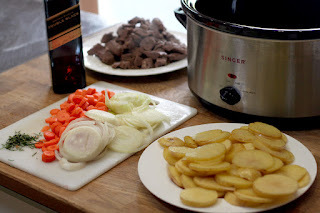 This is a great stew enjoyed all year round but why not make the ladies happy on Saint Patrick's Day. It is always a good time to do a Irish Whisky tasting as well.